It's called Courses, and it's also the name of the restaurant the students operate off Meridian Street on the north side that is open to the public. INDIANAPOLIS — Indianapolis is quickly becoming a foodie destination with new restaurants opening all across parts of the city. With the growth in tourism and conventions in Indy, the culinary and hospitality industries are in desperate need of skilled workers. 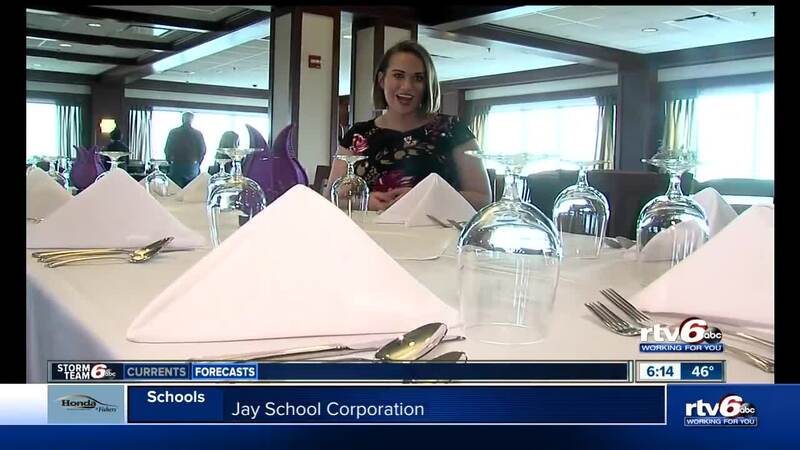 Students at Ivy Tech Community College in Indianapolis are getting a hands-on experience working in a real restaurant as part of their class so they can be ready for a career after graduation. It's called Courses, and it's also the name of the restaurant the students operate off Meridian Street on the north side that is open to the public. "Courses restaurant is a restaurant that is open to the public," Thom English, program coordinator, said. "We are on the 13th floor of our building, so its a great view over the city itself." The class focuses on international cuisine and each week the students gain the experience of cooking food from different cultures, serving the food using proper etiquette, and creating an environment to match the taste of the food that week. Student Allessandra Worley is serving as a manager this week. She's putting her customer service skills to the test at the front of house. "I make sure that the atmosphere is proper to what we are going for with our cuisine," Worley said. "Just from stepping out of the elevator, to seeing the person, making eye contact, talking to them." Worley walks the restaurant to make sure the tables are set correctly. She inspects the buffet of African dishes the class is serving this week. She also adjust the music and decor to reflect the theme of the cuisine. "You get hands on experience," Worley, who also has to be an expert on the history of the restaurant itself, said. "This restaurant was once part of the Gilbert Van Camp mansion so all the woodwork, the fireplace, the stained glass you see is all original." In the kitchen, student Samantha Jean Click is putting her culinary degree to the test, working with African yams. "The African yams, which were very interesting to work with, they are a lot starchier than what we consider as yams," Click said. "Classes like this it just helps a lot because they are intense and they are putting you in situations that you are going to face in the real world." Both Click and Worley have big dreams for their futures after graduation. Worley hopes to return to her hometown of Brownsburg to open a bakery of her own. Click either wants to open a cookery in Franklin where she grew up, or return to the school to teach other students. The faculty and staff at Ivy Tech help guide the students through the process, but in the end, the students run the restaurant on their own while switching off roles to experience everything from the front of the house to the heat of the kitchen. "This is the most trained kitchen staff in the state of Indiana," English said. "These students have spent two years learning all about food. They're running the restaurant so they are doing everything from start to finish." Courses is open to the public by making reservations. Prospective students can sign up for 8-week classes that start in March. For more information on furthering your culinary or hospitality skills with Ivy Tech visit IvyTech.edu/IndyClasses. The students also need the public's support in this program. Discover this hidden gem in the Indy foodie scene by checking out their Global Food Tour. You can explore and taste international dishes and beverages while supporting international student travel. This event is March 7 from 6 to 9 p.m. Tickets are $50 for attendees.